While most children are anxiously awaiting the arrival of the big, jolly fellow in a red suit, who sneaks into their homes through the chimney, with gifts for everyone, or at least this is how the legend has it; Ukrainian children get their small gifts on December 6th, from Saint Nicholas. 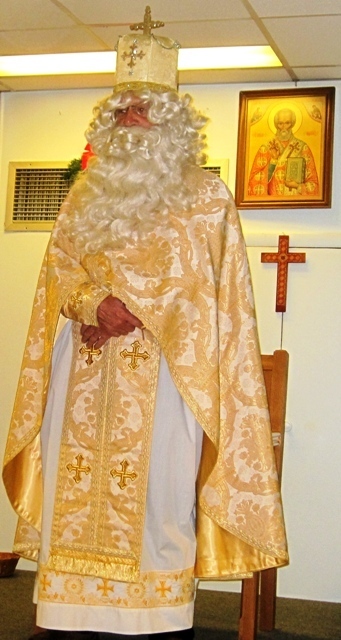 As you can see, his attire resembles the one of a bishop, rather than Santa Claus, and rightfully so, since St. Nicholas WAS an Archbishop of Myra, and was very generous to those who needed it most. If you check my previous post (click on this link) about this holiday, you will learn a little more about my childhood story. Every year our parish was celebrates the arrival of Saint Nicholas, as shown in this picture. Usually the religion teachers prepare a short Christmas play with the children, and everyone sings a special song to Saint Nicholas – “Oy khto, khto Mykolaya loobit” – which translates to “Oh who, oh who loves Saint Nicholas”. As he enters the room, escorted by two angels, he warmly greets all the children and gives out special treats to everyone. A group picture is taken, and the same song is sang as a farewell to Saint Nicholas, who continues his journey to visit other well behaved children. Today I will share few interesting points about the life and kindness of Saint Nicholas, as printed in our church bulletin. The Eastern Churches have a special love and devotion to Saint Nicholas. This love has been enhanced by the liturgical cult that has grown around the virtuous life of Nicholas, who was a Bishop of Myra of Lycia. Saint Nicholas was born in Patara-Lycia, Asia Minor, in the latter part of the third century. He was raised in a good Christian home by his parents, Theophanus and Nina. Nicholas blessed with good memory, loved to read the Holy Scriptures, and to sing in church. His uncle who was a Bishop of Patara, realized that Nicholas was leading a holy life and had sufficient learning to become a priest. His parents agreed, and Nicholas was ordained a priest at age 21. He led a simple life as a priest, devoted to God in service to the poor and needy. When his parents passed away, he inherited their property, which he sold to help the poor. His charity and service to those in need are undoubtedly the virtue by which he is known to us. Many legends and miracles have been attributed to Saint Nicholas. Each of them personifies him as a “model of faith and an example of virtue”. One legend tells that a father of a destitute Christian family decided to sell his daughters into slavery. When Nicholas heard of this, he secretly threw some money into the house. He did the same for all three daughters. When the father discovered that Nicholas was the benefactor, in compliance with his wishes, he promised not to reveal Nicholas’ name. Most of Saint Nicholas’ great works of charity were done discretely. Saint Nicholas lived to an old age and died on December 6th, 342 or 345, thus the celebration of Saint Nicholas Day on that date, for those following the Gregorian calendar, or on December 19th per the Julian calendar. Now you know the story of Saint Nicholas, and why it is celebrated by the Eastern churches. Those lucky children will also receive more gifts from Santa Claus, on Christmas Eve, or Christmas Day, but they suppose to save one of their gifts unopened, and bring it to church on Christmas, to place it under a Christmas Tree to share with the less fortunate children. Thank you for this lovely write up that has brought many pleasant memories of the St Nicholas concerts at this time of year for me as a child and later for my children. Gift giving was not a big part of this season.. However, a new outfit was and I remember the outfits very clearly! Candies, nuts and oranges were all part of festivity of this time! I wish that nowadays gift giving was not taking such a center stage at Christmas time, and the advertising did not start BEFORE Thanksgiving. Some things were better in the past…..families and friends enjoyed each others company with whatever they could afford, but now everyone is trying to out due each other..creating stress and disappointment.